That he would ever be made to suffer. By sentencing your flesh and blood to die? Did you seek to end the big lie? I’m sorry for questioning You so. And that infinity could be brought to naught? Some may think it impertinent or even blasphemous to question God in the manner of the sonnet that opens this essay. However, after writing last week’s essay, With God, It’s Personal, I recalled this sonnet I wrote several years ago and reflected more deeply on the questions of a personal God. We are exhorted by Jesus to ask, to seek and to knock. This exhortation is clearly to encourage us to gain understanding and knowledge of God. The most consistent message Jesus left us with is that our relationship with God is as sons and daughters to a father. If we are to understand and know God, we must seek to know him as a father. I find it fascinating that Jesus seldom spoke of God the creator, judge, avenger or punisher. Rather it was as an adoring and obedient son that he spoke about God. 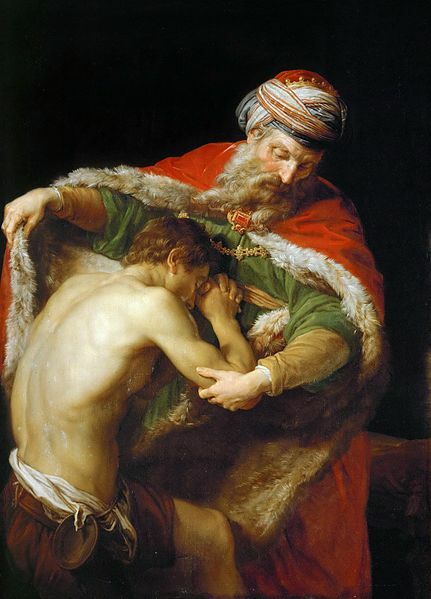 The beauty of the prayer he was asked by his disciples to teach them began with, “Our Father. . .” Jesus’ most famous parable, The Prodigal Son¹, told of a relationship between a father and his son. He said the kingdom of heaven was just like the relationship between a father and his son(it is no stretch to read that Jesus was talking about the kingdom of heaven being like a family of which the father son relationship served as a microcosm). In many theological interpretations of God as the father/creator, the family relationship of father to son or daughter to father is not only minimized, it is said, in the context of original sin, to represent the normal breaking away of the child from the parent to find his or her own way in the world. It is an attempt to explain why there is sin in the world and to place a positive spin on it or to dispense with it altogether. Many go so far as to assert that Adam was simply “growing up”. However, the relationship of humankind to God as father is an eternal and infinite one forged from the creative fires of God’s nature and image, connecting us in a way that gives us life eternal. As I have repeated countless times in my writings, the willful separation from God severs our connection with the eternal and infinite and strips our nature of the image of God. As a result we become lost and our lives manifest all forms of errors that eventually lead to our death and destruction. In the sonnet, I was trying to understand in a personal way what this separation means for God as well as for humanity. While the prodigal son was feeling the loss of all the benefits of sonship as a result of willfully leaving his father, his father at the same time was feeling the pain of the loss of his son. Because we think of God as infinite and all powerful, we rarely stop to think of God as experiencing anything like pain or suffering. Yet, God must have felt, “God-sized pain. . .” commensurate with the love he has for his creation at its willful separation from him. The often quoted verse, John 3:16 is just as often misunderstood as it is lauded. It is in the unfortunate wording that the real meaning is lost. It sounds beautiful and true, that God so loved the world that he gave his only begotten son, that whosoever would believe in him would have eternal life. The deeper meaning here is that God was sacrificing Himself to demonstrate to humanity the great pain and suffering he experienced as a result of His continued separation from humankind. Because of the God conscientiousness of Jesus, he and God were one. There was no separation. Because of Jesus’s obedience unto death, he and God the father as one could show the world the pain of separation; as one they could atone for the results of that separation once and for all. As God vicariously atoned for our sins through his son(here vicarious means in oneness with), we must vicariously feel God’s pain at His sacrifice. That is what it means to “believe”. Belief is not wishing or hoping, it is the joining in the suffering. Unfortunately, humankind has a way of perverting even this. We have witnessed the ritual of self flogging and mutilation by some cultures to physically experience the suffering of Jesus. While this may have the appearance of belief and understanding, in most cases it is nothing more truth turned spectacle. But if this is true, you may rightly ask, then why was such gruesome, barbaric and hideous suffering necessary? Why was the most notorious form of execution ever devised by mankind used to invoke such suffering and death? Why would a father subject his own son to that kind of unimaginable misery? I believe the answer is because the scourging and crucifixion represented the embodiment of all of the worse aspects of man’s separation from God. It was the ultimate manifestation of evil spawned by humanity’s separation from God. It is here that I think another major misunderstanding creeps in. When we think of atonement we naturally think that there is an associated punishment and hence the crucifixion represented the punishment of Jesus in the place of humanity. But this way of thinking still begs the question of what is the nature of punishment. Usually it is to force or coerce a change of behavior through fear of pain. This makes no sense whatever as there was no need to force a change of behavior in Jesus. Mankind had already proven through many millennia that punishment was no deterrent to bad behavior. The only way for reunification of God and man to occur was if one man(the son) stepped up and allowed himself to be consumed by the consequences of humanity’s separation from God. If there could be found one willing to make the sacrifice, then God’s love would redeem that one and all of humanity that joined with him.